As I've mentioned before, I am a huge fan of avoiding a chicken rut. It's so easy to make the same chicken recipe over and over again, the benefits of trying new ones are outstanding! 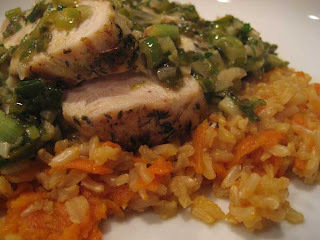 This recipe for Chicken with Scallion-Lime Sauce and Sweet Carrot Rice (not posted online) is a good example of how to have boring old chicken in an entirely new way. You cand find this meal in Express Lane Meals. If you have your chicken stocked the way the book recommends (which I admittedly hardly ever do) you'd only have to pick up the chicken breasts and the scallions from the store. I always go to Express Lane Meals when I know my week will be busy and I need some super quick recipes. For example, this one is from the "Meals for the Exhausted" chapter of the book, which has the simplest recipes. However, as you can see from the recipe below, this meal might be simple, but it certainly isn't boring. If I'd used white rice, this would have definitely been made within 30 minutes. If you're even more than exhausted, just skip the carrots in the rice, since they were a fun bonus, but you wouldn't really miss them. Here's the recipe with my comments in brackets. I typed this up, so any errors are mine! Heat a medium pot owith a tight-fitting lid over medium-high heat. Add about 1 tablespoon of teh EVOO, once around the pan. Add the grated carrots and a little salt and pepper and cook, stirring, for 1 minute. Add the rice and stir to coat in teh oil and distribute the carrots. Add 2 and 1/2 cups of the chicken stock. Bring the stock to a boil, cover the pot, and reduce the heat to a simmer. Cook for 15 to 18 minutes, until the rice is tender [took a whole bunch longer than that since I used brown rice]. Preheat a large skiller over medium-high heat. While the pan is heating up, combine 2 tablespoons of the EVOO, the thyme, lime zest, salt, and pepper in a shallow dish. Add teh chicken breasts and coat thoroughly in the mixture. Add teh seasoned chicken to the skillet and cook for 5 to 6 minutes on each side, or until cooked through. Transfer the chicken to a plate and cover it loosely with aluminum foil. Return the skillet to the heat; add the remaining tablespoon of EVOO. Add the garlic, red pepper flakes, and coriander. Cook, stirring constantly, for about 1 minute, then add the scallions and cook for 1 minute, again stirring constantly. Add the lime juice and the remaining 1/2 cup of chicken stock and continute to cook for 2 minutes. Turn the heat off and add the parsley and butter, stirring and shaking the pan until the butter is completely melted. To servee, slice the chicken on a slight angle. Divide the rice among 4 serving plates and top each pile of rice with a sliced chicken breast. Pour some scallion-lime sauce over each chicken breast. So many fancy pictures -- of what looks to be absolutely yummy. I haven't tried any of the recipies yet - but I'm printing this one out. You are a rock star for blogging with a new baby. I made this tonight. I used butter instead of evoo to brown some garlic and onions with the carrots before adding basmati rice to the pot, I skipped the garlic in the chicken sauce. Soooo yummy! Thanks for your comment, Christine! I love it when people comment on older recipe posts because it makes me remember the recipes again! I might have to add this to the queue again! I've made this numerous times, its one of my favorite Rachel Ray recipes! So easy and so "De-lish!"